We are delighted that you have chosen Meadowhead Parks and we will do everything that we can to make sure that your stay with us is as memorable and enjoyable as possible. To make things easy for you, here are some directions and map to show you how to get here as well as a map showing our site layout and facilities. For the benefit and enjoyment of all our guests and to maintain our high standards we do have some Park Rules which we would ask everyone to respect. If there’s anything else that you would like to ask us, please give us a call and we will be delighted to help you. 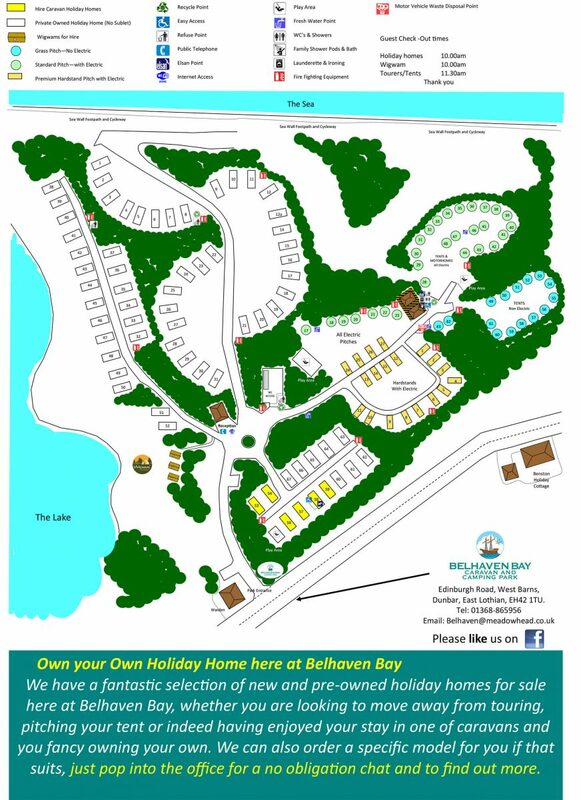 We look forward to welcoming you to Belhaven Bay Caravan Park in person. From the A1 North or South exit at the roundabout West of Dunbar. The park is approximately 1 mile down the A1087 towards Dunbar. Dunbar is on the main east coast Railway Line. From the station, take the Edinburgh bus which passes by the park entrance. 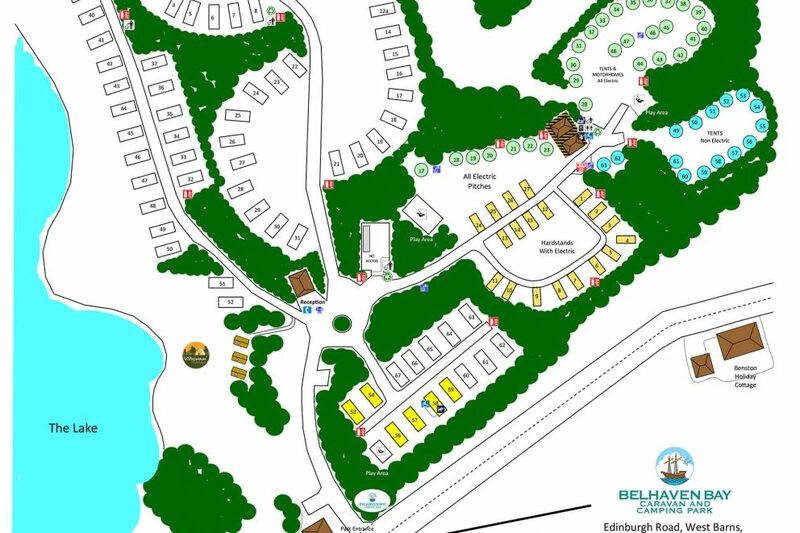 As you’ll see Belhaven Bay Caravan Park isn’t the largest park in terms of pitches but it is spread out generously within the John Muir Country Park. We would be extremely grateful if you could take the time to download a copy of the map so that you can familiarise yourself with where you will be staying and our facilities before you head off. Our guests do find this to be a useful thing to do. Please keep noise level to a minimum throughout the day and observe silence between 11.00 p.m. and 7.00 a.m. Please be a considerate neighbour to other guests who may have put children to bed, thank you. Responsible dog owners are welcome on the park with the agreement that all dogs are kept on a lead. Dogs are not to be left unattended and are not permitted in the children’s play area or in any buildings. Certain breeds of dog are not permitted. It is the owner’s responsibility to clean up after their dog. Pitches are to be kept litter free there are number of refuse points available, please see map for details. Recycling facilities are available at the overnight car park area adjacent to the reception building. Please Recycle !!! Washing lines are not permitted on the park. Please do not tie anything to our trees. Washing lines present a danger and especially when light levels are low. There is a well equipped launderette on site offering mechanical drying facilities as well as ironing. Open Fires are strictly prohibited anywhere on the park. Please note the location of your nearest fire fighting equipment before you pitch up. Always turn off LPG gas supplies when not in use. Please do not store combustible material such as petrol, paraffin or another other flammables. You are not permitted to activate any firework, explosive or Chinese lantern. If unsure about fire safety then please talk directly with the park management. BBQ’s are only permitted if kept directly off the grass. Portable and throw away BBQ’s can only be used if a slab is placed underneath the BBQ. BBQ’s must be disposed of properly and must not be left unattended. Please do not operate any BBQ indoors, or in any tent or awning. Any damage caused to the grounds or property will be chargeable. Always dowse portable BBQ’s thoroughly with water before disposal, thank you. For everyone’s safety there is a 10 M.P.H. (16 K.M.H.) speed limit on the park which must be strictly observed at all times. Children are at play, please drive very carefully. Please take great care when reversing and if possible use a second person for safety reasons to see you back. Situated next to reception Open 24hrs. We do everything we can to preserve the rural character of the park therefore the park may have areas of uneven ground, tracks and paths and limited lighting. Please take care and use a torch to illuminate your path. All children must be accompanied by an adult at all times. In the event of a lost child please report to reception for assistance. You will be required to provide an accurate description of the child and when, where and with whom they were last seen. Contact the police in support in this event. Are not permitted to be used on the park at any time. Guests in tents and awnings are requested to lift their groundsheets (where possible) during the day when the tent or awning is not in use. We are grateful for your support with this. Tent guests staying longer than one week may be asked to move pitches at the request of the park manager. Security guards often patrol the park. Please, always follow the instructions given by our security team, they are provided for your safety and enjoyment. Please secure your property as you would at home. Commercial vehicles are not permitted on the park except with the express permission of the Park Manager. Additional rules may apply in this instance which must be adhered to. Chemical disposal points are available for your use on the park, please see park map. Please do not put non bio degradable products into our drainage system, this includes wipes of any description, nappies, chemicals or sanitary towels. Please use the correct facilities provided for this purpose, thank you. Please use the shower cleaning facility provided, i.e. mop and bucket, to clean out your shower area after use. This is greatly appreciated as common courtesy among caravan and camping guests. Ball games & kite flying is permitted in the designated area, see map. The use of remote control activities such as planes, helicopters, motorised scooters, roller blades and skateboards are strictly not permitted. If you have guests in your party who are disabled or have special needs then please let us know. We will always do our best to exceed your expectation and help where we can. Wi-fi is available in areas of the park and at reception, please ask. Excellent break and very much exceeded our expectations. Excellent facilities and setting.